1. In medium skillet, heat oil over medium-high heat. Add onions to skillet, and cook until softened, about 3 minutes. Reduce heat to medium, add garlic and ginger, and cook another 2 minutes. Add tomato paste and salt; cook and stir 2 minutes. 2. 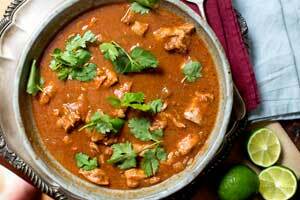 Place chicken pieces in a slow cooker, then add tomato paste mixture, lime zest and juice, coconut milk and chicken stock. Stir everything together, cover and cook on low heat setting for 4 1/2 to 5 hours, until the chicken is cooked through.